Oka nagan Feast of Fields, the annual fundraiser for FarmFolk CityFolk was held at Father Pandosy Mission on Sunday, August 12. Chef Butters may hold the crown for the Chef who has participated in the most Feast of Fields events in it’s history. He was part of the event when he worked on the island, again when he was in the Lower Mainland and has not missed an Okanagan Feast in it’s 10 years in the valley. Feast of Fields is an event with a mission. Every dollar raised helps FarmFolk CityFolk support sustainable agriculture and celebrate local food within communities across British Columbia. 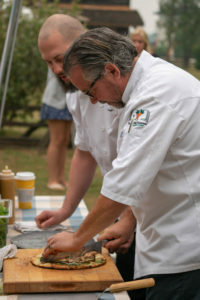 The idea for this gourmet local food celebration was borrowed from the Ontario based not-for-profit Organic Advocates – established by chefs Jamie Kennedy and Michael Stadtlander. 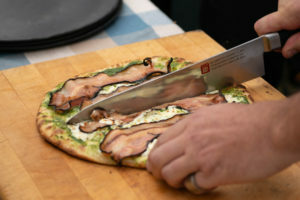 The 500 guests who attended the event each year look forward to eating and drinking local. 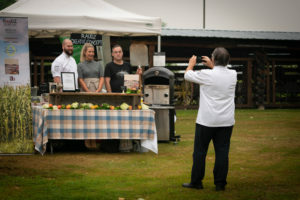 This year, Chef Butters, Chef Braun and Chef Hanna rolled out the portable forno pizza oven and created a lineup for their Okanagan Pizza. 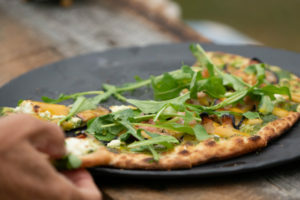 Featuring Illichmann’s gypsy bacon, Le Petit Clos peaches, Happy Days chevre, Bonnie’s Everything Green herb pistou and topped with Wise Earth Farms argula, no one minded the wait.